As I was returning from representing a client in Jefferson County Circuit Court today, I was pleased to see a number of signs in support of Lori Compas and the Recall of the current Governor. There were, much to my chagrin, a number of signs in support of the current Governor. One such sign in particular caught my eye. It was a large hand-painted sign that read, “Thank You Governor Walker.” It gave me cause for reflection, what has the current Governor done that is worthy of thanks? Thanks Scott, for raising taxes on low-income, hard-working parents by reducing the Earned Income tax credit while giving tax breaks to the wealthiest of our citizens. Thanks Scott, for raising taxes on the elderly and students by reducing the Homestead tax credit while giving millions of dollars in tax breaks to corporations. Thanks Scott, for lying each time you say the budget is now balanced when you know under properly-accepted accounting methods, it is not. Thanks Scott, for repealing the collective bargaining rights of hard-working dedicated public sector employees who, unlike you, provide a valuable service for their keep. Thanks Scott, for lying about the rationale for the repeal of collective bargaining rights by insisting that it was a necessary step to reduce the budget deficit when you yourself testified before Congress that it did not save the State a nickel. Thanks Scott, for your assault on public sector unions, which is nothing more than a transparent and cynical attack on perceived political enemies solely in the interest of perpetuating your reign and fostering a one-party system. Thanks Scott, for defunding public education to the tune of over one billion dollars, from K-5 through our technical schools to our once-great UW system, in the interest of privatizing education. Thanks Scott, for lying about the profound negative impact from these cuts, extant and to come, by claiming that there has been no effect on public education wrought by your unparalleled reduction in funding. Thanks Scott, for vilifying and denigrating those who toil in perhaps the most honorable and important of all professions, our teachers. Thanks Scott, for being the first Governor in the history of this State to form a criminal defense fund in the face of a John Doe investigation and to funnel tens of thousands of dollars from your aforementioned campaign treasure chest to pay for extremely expensive criminal defense attorneys. Thanks Scott, for lying about your intentions in forming this legal defense fund with the absurd claim that your attorneys are retained to “assist” in the John Doe investigation as opposed to defending and protecting your own interests. Thanks Scott, for depriving women of the rights of redress in the Courts they had under the Equal Pay Act. Clearly, you do not believe women are worthy of the same pay for the same work as men. Thanks Scott, for signing into law measures that interfere with and invade the most private and emotional consultation between women and their physicians and subject physicians to criminal penalties if they dare defy your edicts. Thanks Scott, for enacting laws that render unto you the unprecedented power to enact, amend or repeal administrative rules that have the force of legislation. Thanks Scott, for using that unbridled power to repeal compensation structures for professional public employees, teachers in particular, that will almost certainly result in further reductions in income for many of up to an additional thirty percent beyond the ten percent you took last year. Thanks Scott, for enacting Voter I.D. legislation that would deprive tens of thousands of Wisconsin citizens of their legitimate and precious right to vote. Legislation which has properly been determined to be unconstitutional by Judge Richard Niess. Thanks Scott, for your continuing efforts to deprive thousands of children and families of health care. Thanks Scott, for enacting an agenda and policies that give Wisconsin the distinction of having the worst record for job creation in the United States since you took office, with a net loss of jobs under your direction. There are, believe it or not, a good number of other reasons to “thank” Scott. I am certain you can think of a few. Finally, I would like to offer a sincere thank you to a former Governor of this great State, Bob Lafollette, who gave us the Constitutional right to RECALL. I really wish someone would pursue the fact that it has now been proven that Scott Walker did in fact lie to Congress. I’m referring of course of the divide and conquer video released on Friday. Charges need to be brought forth. This proves beyond a shadow of a doubt that governor John Doe has an agenda he is pushing and it has nothing to do with balancing the budget. He acts as though he is the first one in Wisconsin history to ever achieve such a feat. I get the fact that people are tired of the level of taxation we have here in WIsconsin. The part I don’t get is how many Wisconsinites are willing to forego democracy because they believe Scott Walker is some sort of a god who has come to finally destroy those who seem to have far more than the rest of us. What I find even more disturbing are those Walker supporters who seem to be ok with whatever he does since he made things like concealed carry and castle doctrine a reality. The other thing I don’t get is most Walker supporters seem to be ok with the boatloads of money Walker has solicited from out of state sources. My main question is what kind of favors will be expected from those Mr. Walker is beholden to for $25 million. Surely nothing that will be good for those who pull down far less than 7 or 8 figures annual. Wake up people! Democracy is being stolen from right under your noses and you are enabling it! I voted for Scott Walker and have regretted it ever since. I am part of the problem. I helped put him in office. The recall is a way to right this wrong. 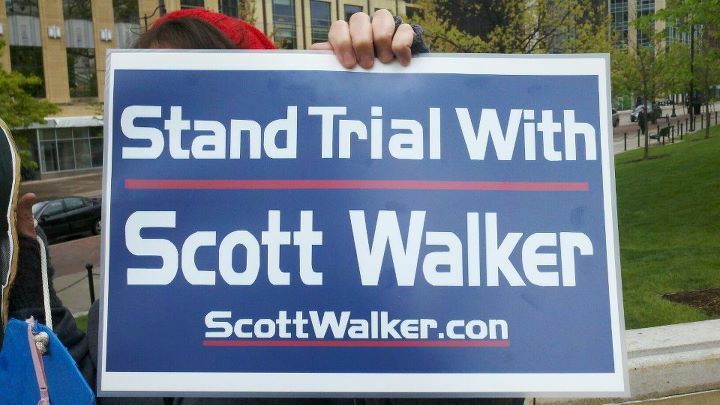 I stand with Wisconsin, not with Scott Walker! In closing, todays GOP is far more terrorizing than Al-Qaeda ever was. Would you (wcmcoop) post the art / image of the sign in the photo above so we can print it and put the image in the windows of our cars and homes? it’s great! Thanks!